KUALA LUMPUR --- “As at December 2017, Malaysia reaffirmed its position as the leading global Halal hub with an annual export value of RM43 billion for Halal products and attracted investments worth RM13.3 billion in HALMAS Halal Parks. To date, a total of 28,000 jobs were created. These contributed approximately 7.5% to our nation’s Gross Domestic Product (GDP) for last year,” said Malaysian Deputy Prime Minister Dato’ Seri Dr Ahmad Zahid Hamidi. WHW 2018 is organised and led by Halal Industry Development Corporation (HDC) as the central agency under the Prime Minister’s Department of Malaysia in collaboration with the Malaysia External Trade Development Corporation (MATRADE) and the Department of Islamic Development Malaysia (JAKIM). Themed “Building for the Future”, World Halal Week has become pivotal in steering the growth of the global Halal industry. The theme is most timely as waves of innovation are pervasive in Islamic economy in the recent years, fostering the generation of a wide spectrum of Islamic financial products and services. 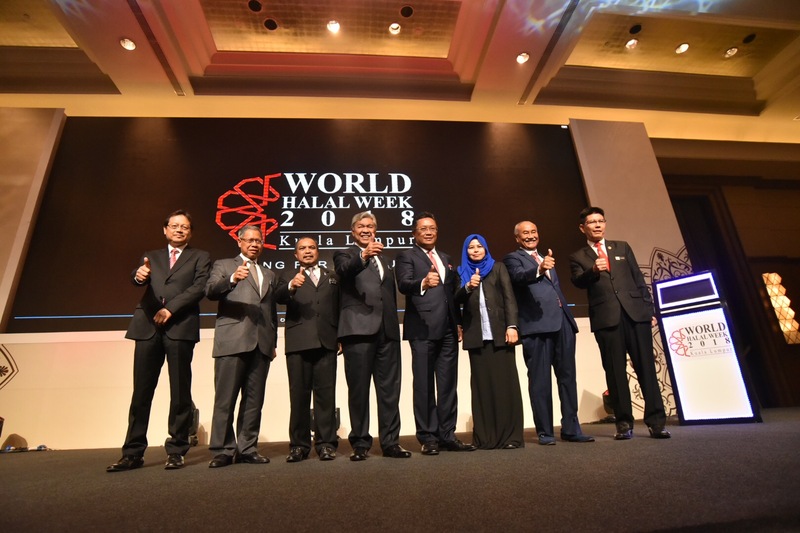 WHW 2018 comprises of three major components: a two-day World Halal Conference 2018 (WHC 2018) organised by HDC which starts today (April 4); the Malaysia International Halal Showcase (MIHAS) from today until 7 April organised by MATRADE; and the Malaysia International Halal Assembly (MyHA) which started on 26 March and ended yesterday (3 April) organised by JAKIM. Speaking of the World Halal Conference which starts today, HDC Chief Executive Officer Dato’ Seri Jamil Bidin said the event brings together more than 1,000 delegates from more than 50 countries to discuss an underlining theme “Whither the Next Economy?” It is an international platform to highlight the areas of Malaysian expertise that seeks to become a global benchmark in the development of the Halal industry. “Industry players of Halal products cannot alienate themselves from what is rapidly happening around us – they must adapt, because the technology applies to everyone now and our role at HDC is to nurture and develop these companies to be ready for the global revolution,” said Dato’ Seri Jamil. The 10th WHC 2018 will focus on five panel discussions namely on Game Changer: Economy Revolution; Emerging Trends of Global Economy & Implications to Malaysia’s Halal Industry; the Internationalisation of Islamic Economy: Global Integration & Strategic Collaboration; Halal & Science; and Managing the Brand. This year, more interesting segment of the conference will be led by His Royal Highness Paduka Seri Sultan Perak Darul Ridzuan Sultan Nazrin Muizzuddin Shah Ibni Almarhum Sultan Azlan Muhibbuddin Shah Al-Maghfur-Lah which takes a look at global integration and strategic collaboration in internationalising of Islamic economy. On the trade promotion end, the Malaysia External Trade Development Corporation (MATRADE) will organise the 15th edition of Malaysia International Halal Showcase (MIHAS) from 4th to 7th April, 2018, at the Malaysian International Trade and Exhibition Center (MITEC). The largest MIHAS ever, this year’s edition has attracted the participation of over 800 companies in various Halal sectors including food and beverage, pharmaceutical, cosmetics, finance, tourism, ecommerce and logistics. MIHAS which is currently the largest trade fair dedicated to halal economy in the world has attracted exhibitors from over 40 countries, including Indonesia, Thailand, China, the Philippines, Japan, France, India and South Africa. MATRADE has also, as part of its “International Sourcing Programme” (INSP) invited over 200 international buyers to attend MIHAS. These buyers were pre-selected by MATRADE’s 47 worldwide offices. Visitors to MIHAS will also have access to the multitude of programmes that are being organised in conjunction to MIHAS at MITEC such as the Halal Trade Finance Conference, Halal in Travel Seminar, MyPITCH@MIHAS 2018, IMHALAL Conference@MIHAS and Halal Gelatin Industry Ecosystem Seminar. Malaysia International Halal Assembly (MyHA) is a combination of four programmes; the Halal Professional Board course, International Halal Capacity Development Programme, Halal Certification Bodies Convention and the International Halal Authority Board General Assembly; started from 26th March to 3rd April 2018 that was held at Le Meridien Hotel Putrajaya, Malaysia,. More than 900 participants from over 42 countries were expected to be in attendance. Returning for the 9th year, the Halal Certification Bodies Convention (HCBC) in 2018 brought another exciting theme – “Halal Connecting the World”. HCBC is a convention that gathers together, leaders in the global halal industry, religious authorities as well as Halal professionals from all over the world to provide insights on the halal industry. OR Ghazalie Abdullah at +6017 3361090 or email ghazalie@gra-pr.com OR Harris Iskandar Taib at +6019 2711609 or email harris@gra-pr.com OR Nur Asyila Ahmad Tarmizi at +60104006015 or email asyila@gra-pr.com.